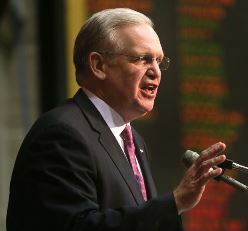 Missouri Governor Jay Nixon’s veto of the Republican anti-worker right-to-work legislation was upheld with bipartisan support. In a vote that will hearten workers in Missouri, state lawmakers rejected an effort to make Missouri the 26th right-to-work state. “Today’s bipartisan action by the legislature to uphold my veto of this divisive, anti-worker bill is a victory for workers, families and businesses here in Missouri and across the country,” said Missouri Governor Jay Nixon (D). The IAM has been fighting the influences of big corporate special interests to cut wages and weaken the middle-class across the country. The bipartisan vote exposes a weakening grip in Republican-held state houses where those deep pockets have been successful in passing anti-worker legislation. The push for right-to-work laws has nothing to do giving workers freedom to choose. It is about taking away the tools unions have to defend the rights of those workers. The Missouri bill’s failure is a setback for those who thought that the state would be another notch on their anti-union belt. But the battle is far from over.